Target stands - a quick, easy solution. Less setup, more shooting. Getting off that flat range, into the field and dealing with hasty positions and setups is one of the best ways to develop your shooting. It is all very well being able to punch tiny holes in paper, but if the goal is to shoot better in the field, then you need to shoot in the field more. Maybe it’s not competition, like field shooting or multigun, maybe you just want to be able to quickly set up some targets in the back paddock and spend the afternoon plinking away with some mates. Regardless, some good target stands make a big difference – you get good feedback on hits (or misses), you don’t have to spend half the time messing around with broken bit’s of gear and that means you spend more time shooting, less time setting up to shoot. Enter – The Last Stand target stands! I am not 100% sure where I first saw these target stands – likely facebook or through a forum – however, after catching my eye a couple of times, I decided to get a couple on order. Much to my surprise, they turned up less than a week later – fast, fast turnaround I have to say! The target stands (that I ordered) are the green moulded parts. 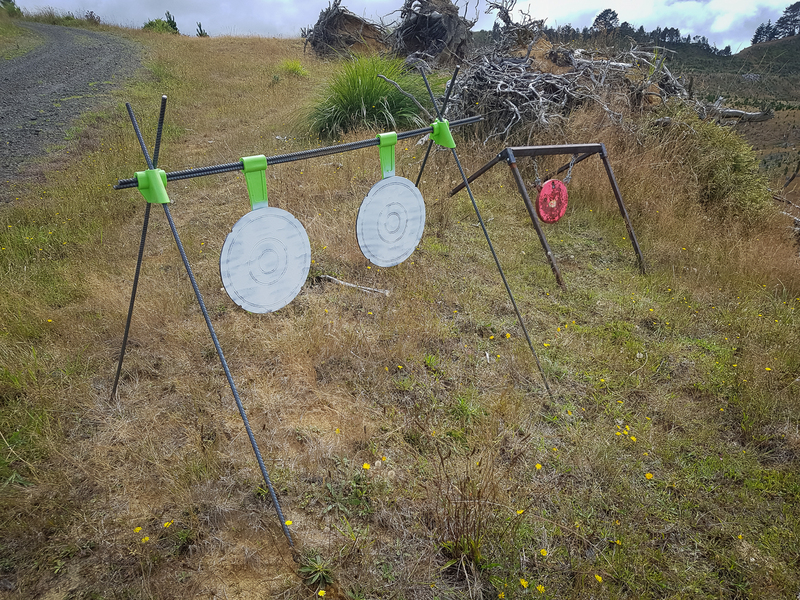 You can also order the steel targets themselves, but I figured the less weight I needed to get sent over from the states the better, and, I had already had some BisAlloy500 targets made up – so ordered the fittings, sourced some rebar and had some bolts welded onto the back of the targets. 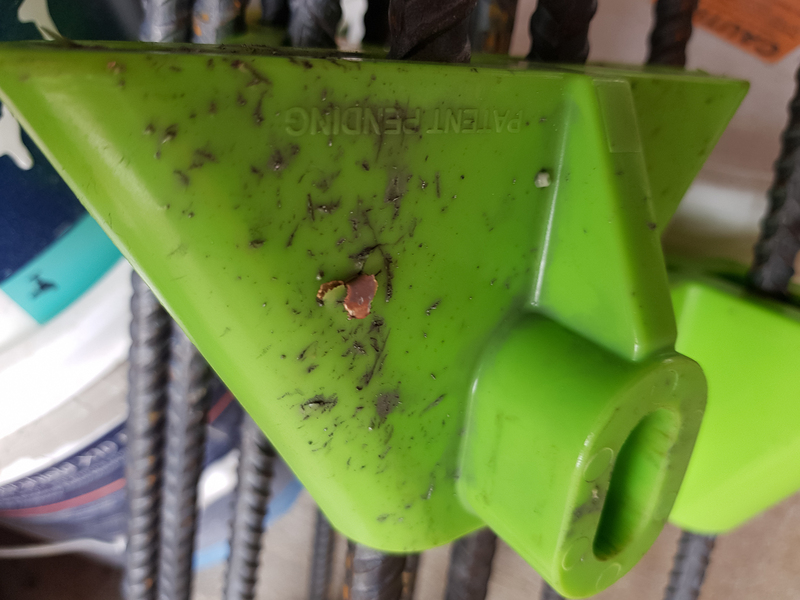 The fittings are made out of a self-healing rubber – that is, if you put a round through one, the projectile will pass through, but the fitting itself will not break, shatter or otherwise become unusable. 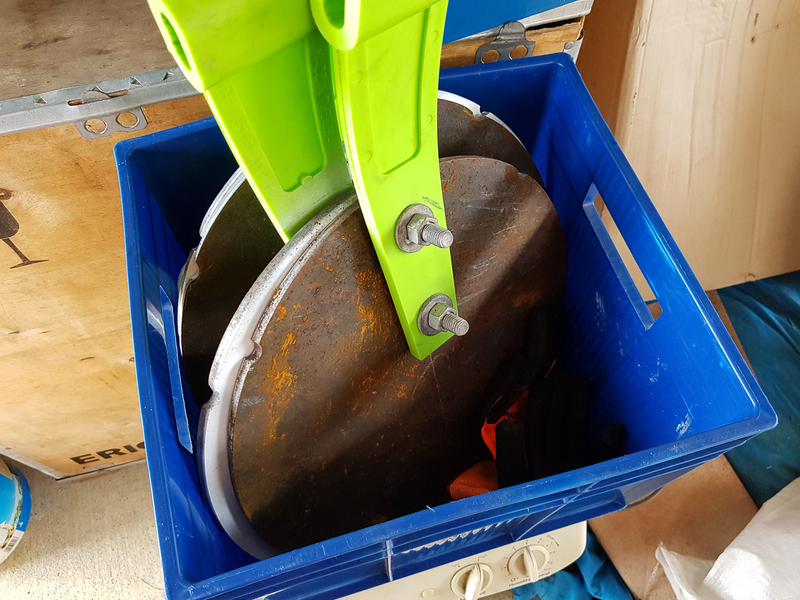 Sure, after a couple of thousand rounds, I think these might warrant replacing – but I have seen some photos online of some very hammered stands that are still going strong. That stands, packed up, take up a relatively small amount of space. Small enough for the truck, tray, or even boot of a car, depending on your transport, really, the width of rebar being the consideration – they could also easily be strapped to the front or back of a quad bike to drive out around the farm. I just put the gongs, with the hangers bolted onto the back of them, into a box along with a couple of cans of spraypaint, extra nuts and a pair of handling gloves1. 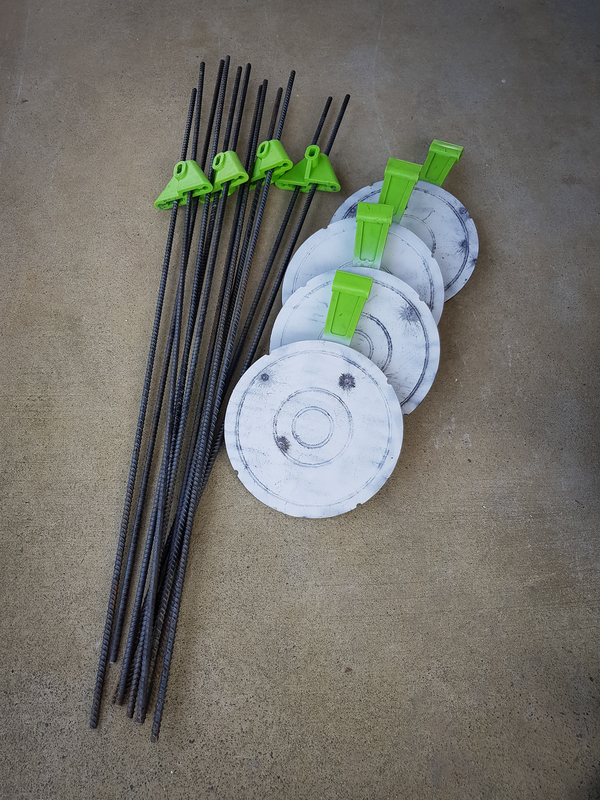 Essentially, for each stand, you need the two end fittings, six pieces of 12mm rebar and hangers for however many targets you want to put on them. I cut all the rebar the same length, for easy – each about 1.5 meters long (you get an even amount of pieces out of a length of 3m rebar length that way). Two pieces of rebar go into each end fitting for the legs and two pieces of rebar are used as the cross member. Once you arrive where you are setting them up, deployment is easy and quick. Sure, two people are easier, but one person is no major either. These targets stands are super easy and fast to set up, position and breakdown! When you first put them up, initial impressions can be that the whole stand is a bit flimsy and wobbly. However, you can pull the rebar legs out a little to steady things up, if you are in a clay-like environment, it’s easy to just push the legs in a little, but more importantly, it’s important to note that this movement in the frame causes no real issue – because – the steel in the middle keeps the whole system firmly planted, even when hit close with centerfire rifles. In fact, this movement is also part of intentional shock absorption. 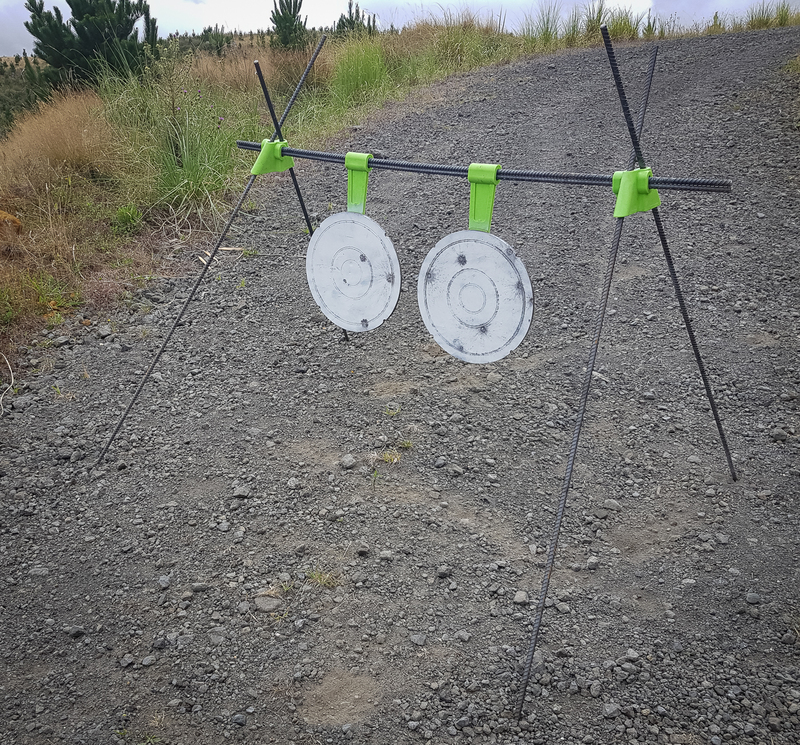 Initially, we set them up at 100m with a bit of board, some zeroing targets and a gong on them. We just wanted to quickly confirm zero before setting up the targets further. In hindsight, I did something stupid. Not related to the stands, related to the target. 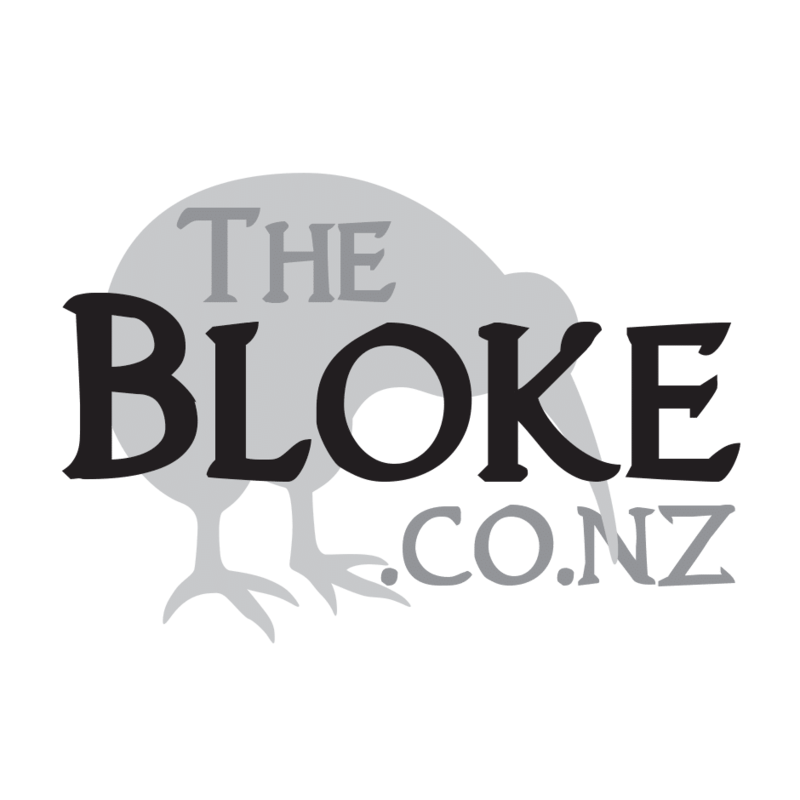 I got the gongs made up at 8mm for weight considerations – I want to be able to ruck the stands and a gong out into a remote area if I want to – setup and shoot. 8mm was chosen as a compromise between weight and being able to shoot with centerfires. 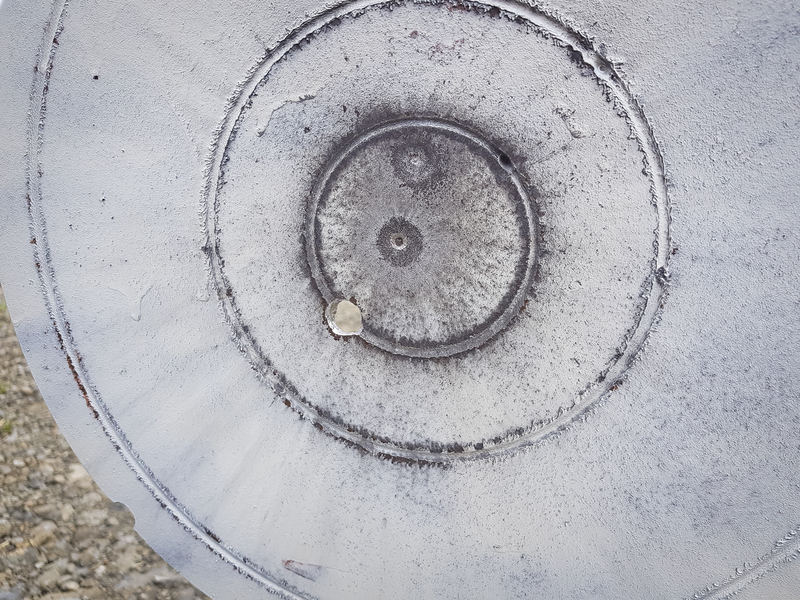 This is what happens when you drill an 8mm BisAlloy500 target at 100m with a 300WSM. Again, in hindsight, not really that surprising. The two other marks are a couple of .308 rounds. The target stands themselves, no issues – the gong hit, rang like a mofo and returned to exactly where it was. So, ‘high power’, silly close range, no issue. From 200m+ the steel had no indent, even from the 300WSM. 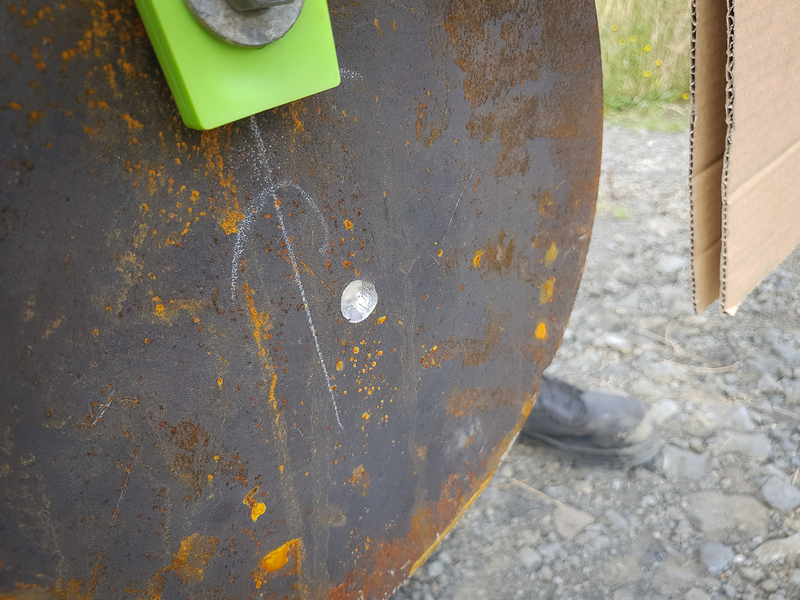 This target will be patched up, but also used for testing on some bigger cartridges when available as well (.338 and .415 – you can keep you 50cal at home thanks). The stands themselves worked flawlessly. Quick to set up, quick to move, we simply folded them down, put them in the truck, drove out further and set up again. I was out, shifted and back while the guys were still deciding on our next shooting position (and spotting goats). I couldn’t be happier with the target stands! We were able to directly compare them to the ‘in-situ’ stands that live on the property. Functionally the same (though the 8mm gives a better ring), but lighter, much easier to break down and setup. Sure, probably more expensive, but that seems relative to function in this case. One thing, which I had read about, and (not personally) got to experience – was the need to use gloves while handling the fittings. This is due to projectile jacket splatter. The target stands have tasted blood. I pull these out when I get home with some pliers, but just be wary when picking them up in the field. Sure, some guys are going to look at the price and say ‘I can make them cheaper myself’ – well, kinda. You can make some stands that will work in a similar manner for cheaper – galvanised fittings and pipe (or rebar) has been done, works, and will be heavier and a little more fussing around to setup. If you have a fab workshop, even better – you can likely make something a little more elaborate up for yourself. For those who don’t (wor like the convenience of quick, light setup) – these stands are a very, very cool option. I will definitely be bringing some more in for myself, and likely to get some extras to sell on The Gearlocker as well. Can you see some stands like this working for you in your field shooting endeavors?